The long division method is used when you are dividing a large number (usually three digits or more) by a two-digit (or more) number. It is set out in a similar way to short division (the 'bus stop' method). 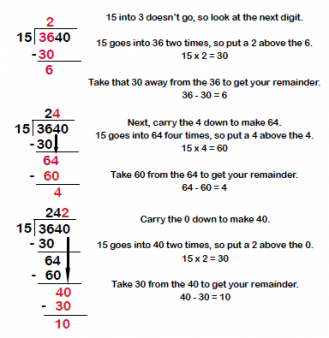 Long division is set out in the following way. When do children learn to use different division methods? Children start learning about division in Year 1, where they may be asked to share an even number of objects between two people. They start learning their times tables in Year 2, at which time they also learn their division facts (for example, they learn that if 4 x 5 = 20, then 20 ÷ 5 = 4). They continue to learn the rest of their times tables, including division facts through Year 3 and Year 4. 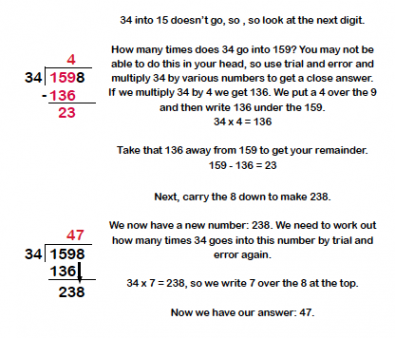 In Year 5 they will learn to divide three-digit and four-digit numbers by a one-digit number using short division (this is also known as the 'bus stop' method). They then move onto dividing larger numbers by two-digit numbers using long division, as shown above. Teachers formerly used to teach children the method of chunking, however under the 2014 curriculum they are advised to use short division and long division. It is very important that children are taught division in the context of problem-solving. I have 20 sweets. I share them between 4 people. How many sweets do they have each? They may be encouraged to use counters to share out the 'sweets', but will be guided to move towards using their knowledge of division facts to work out this problem. There are 42 children in a playground. They are divided into 6 groups, with an equal number of children in each. How many children are in each group? There are 564 beads in a jar. They need to be divided equally into six small jars. How many beads will be in each jar? I buy 23 cakes, each costing the same amount. The total comes to £11.04. How much does each cake cost? It is really imperative that children get their heads around division in the context of their times tables, before they can go onto dividing bigger numbers. You can really help your child at home by asking them plenty of mental division questions in relation to their times tables. It is also important that, in later KS2, they learn to divide numbers by 10 and 100 confidently and efficiently. What is the bus stop method for division?